Who Is Responsible For The Lakers' Turmoil? LeBron James? You are here: Home / News / Who Is Responsible For The Lakers’ Turmoil? Who Is Responsible For The Lakers’ Turmoil? (ThyBlackMan.com) The biggest question in Southern California right now is -WHAT HAPPENED TO THE LOS ANGELES LAKERS?- With one of the strongest young cores in the NBA, and perhaps their biggest free agent acquisition since Shaquille O’Neal in LeBron James, it was only 5 months ago that the Lakers were hailed as one of the more promising up-and-coming teams in the league. Was the excitement in the city warranted or was this simply another case of “sometimes when it’s sunny, it rains so hard”? Far before a March 22nd loss to the Brooklyn Nets officially eliminated the Lakers from the playoffs for their 6th consecutive season, there were fingers being pointed at everyone, from Laker coach Luke Walton, all the way down to the team training staff. The blame made its rounds, hitting every conceivable target on its way. But like most things in life, it should always be the man at the top accepting blame just as gracefully as he welcomes the credit.. That man is none other than Lakers President of Basketball Operations himself, Earvin “Magic” Johnson. While Magic made strides in his first 2 seasons with the Lakers, it was the offseason of 2018 that began what would be his domino effect of inexperienced moves hindering the team. After freeing up a max slot by trading current Brooklyn Nets rising star D’Angelo Russell in the summer of 2017, followed by the buy-out of veteran forward Luol Deng a year later, the Lakers were left with enough cap space to acquire two top tier superstars. At the time, this plan seemed like money in the bank. But when free agency of 2018 came, instead of putting his chips into signing current MVP candidate Paul George, Magic jumped the gun and made aging superstar LeBron James his top priority- Big mistake. On the surface, acquiring the biggest name always seems like the right thing to do in Lakerland. But once we dig deeper, we can actually see how wrong that notion was in the curious case of Magic Johnson. First and foremost, LeBron James has always been known to need multiple superstars around him in order to succeed. LeBron was in no way, shape, or form the correct fit to help the core development of an organically grown, young team that showed immense promise and made huge strides in the 2017-2018 season. This is where a player like Paul George (who was also among the top free agents available) would have fit in seamlessly. Based on the accounts of George’s agent Aaron Mintz, the entire reason he didn’t sign with the Lakers seemed to be rooted in his disappointment with the way he was treated by them- like a back-up plan as opposed to the primary target. Why would George turn his back on his team, the OKC Thunder, that treated signing him as their primary focus, for an organization that made him an afterthought and was planning to have him play second fiddle to an inferior player who would get all the credit? After all, playing with LeBron has turned out to be a nightmare for many. The notion that LeBron makes players around him better has been debunked long ago. In fact, players who team up with LeBron have historically suffered across the board in terms of statistics and overall performance. In NBA circles, LeBron is considered the opposite of what the media portrays him to be.. As Kevin Durant recently expressed, it’s hard to understand why anyone would want to play with LeBron due to the fact that it makes for a “toxic environment”. An environment so toxic, it becomes difficult for others to shine under his patented “Bron Ball” offense, which lacks true flow and proper ball movement. Why else do you think former teammate Kyrie Irving ran for the hills? It’s the same reason most superstars are wary of joining LeBron’s circus of everlasting drama. Toxicity. Not until LeBron proclaimed that he did not feel the need to win a championship in LA due to his individual legacy already being cemented did the general consensus begin to see his ulterior motives come to light. It was still hard to believe for some, but when LeBron opted to sit out an important early February game against the Golden State Warriors for “load management”, nobody expected to see a video surface of him hanging out in the studio with rap star 2Chainz at 3:00 am on the day of the game. If LeBron’s heart was 100% in basketball, there is absolutely no way he would find the time to focus on anything but his mission; giving an honest effort at a Laker playoff push. In the Western Conference, there was never such thing as “activating playoff mode” in late February, as LeBron insecurely proclaimed he would do prior to going 1-7 the following 2 weeks. It became glaringly obvious how easy LeBron had it playing his entire career in the second-class conference- The type of luxury that can spoil even honey. So if LeBron is creating this mess, why is Magic responsible? Simple..Magic, being a consummate alpha in his playing days, should have had the vision to foresee that LeBron’s agenda was different than his own. He should have made sure to establish himself as the head honcho in the relationship prior to signing LeBron. Magic accepted LeBron without instituting a pecking order and setting guidelines, like a star-thirsty rookie at his job (that’s actually what he is), which LeBron James took full advantage of. With Magic failing to properly position himself at the top, LeBron brought his act to town and started the kind of drama his Hollywood scripts can only dream of -mainly through his passive aggressive nature and self-centered personality.- We are talking about a guy who got on social media and gloated about his individual statistics after some of the worst losses of his career… during a crucial run at the playoffs! That is the polar opposite of what Laker tradition stands for and Magic should be the first to understand that. If Magic doesn’t have the guts to take LeBron aside and explain that to him, then who will? Still, Laker fans took comfort in knowing that Magic’s ultimate plan was always to sign TWO max free agents, and LeBron was only the first. The problem here is that LeBron’s shenanigans over the course of the season might have been the final straw for future free agents who were already skeptical about teaming up with him to begin with. After reports surfaced that LeBron was trying to play GM and have practically everyone on his team traded mid-season for Pelicans superstar Anthony Davis, the Lakers spiraled out of control. When it became obvious that these reports were being leaked by LeBron’s agent Rich Paul, Lakers owner Jeanie Buss was said to be so infuriated that she wanted to trade LeBron (not a bad idea, but we’ll get to this later). Nobody on the Laker squad seemed to trust LeBron anymore, as he kept making everything about himself with his comments to the media, further isolating himself from the team and causing irreparable dissension. It was only then that the Lakers totally fell out of playoff contention and LeBron’s circle reportedly shifted their focus to blaming head coach Luke Walton. The toxic environment that Kevin Durant referenced was now becoming pestilential. Back when LeBron played for the Miami Heat, their President was the legendary Pat Riley. Unlike Magic, Riley was the kind of guy who was seasoned enough to understand the nuances of running an organization. So when LeBron pleaded with Riley to fire Heat head coach Erik Spoelstra, Riley put his foot down and refused to let LeBron run the show. Similar to Spoelstra during LeBron’s Heat tenure, Luke Walton is a young coach without an abundance of experience. Luke’s success was amongst the best in the NBA in his first two years with the Lakers, leading the entire league in team improvement with +9 wins in both his rookie and sophomore seasons. The Lakers were clearly trending up under the young Luke and things were looking good.. before LeBron came through and crushed the buildings that is. After Luke was rumored to be on the hot seat due to LeBron’s displeasure, Magic failed to back his coach in the same way Riley did with Spoelstra. And although Luke’s rotations have been questionable at times, he did his best trying to maneuver his way around LeBron’s selfish antics. To make matters worse, reports leaked that Luke’s coaching staff pleaded with Magic to re-sign forward Julius Randle and center Brook Lopez- who, interestingly enough, are both finding great success with their new teams. Sadly, Magic ignored these wishes and apparently even felt like he could replace what he was losing in Randle with Michael Beasley. Incredible! Magic even went as far as turning to LeBron for advice on who to sign.. And after some consulting, Magic signed Lance Stephenson, Rajon Rondo, and Javale McGee; none being known for their shooting. All of a sudden, D’Angelo Russell and Julius Randle began to feel like exactly what the Lakers were missing.. so where does Luke Walton fit into all this? Somewhere between “this is all your fault” and “you’re fired!”.. Every loser needs a scapegoat, after all. So are the Lakers doomed? Are they in for another three years of reality-TV-level drama? It’s not impossible, but it’s hard to imagine LeBron bridging the gap. It doesn’t seem like he understands what kind of organization he’s playing for when he preaches against solidarity by adamantly expressing that players don’t need to be loyal to their franchise. He’s constantly telling the world that it’s merely a business while being the one low-key trying to trade half the team and killing any semblance of chemistry. The Lakers went from a team having fun playing together, clowning each other on social media, and developing friendships far beyond basketball, to a team that lacks confidence, plays for themselves, and always seem to be looking over their shoulder under LeBron’s leadership. Why would the leader of a team destroy the hopes and dreams of his young counterparts? What exactly is it that makes him preach disloyalty? The self-serving ways that LeBron was teaching the youngsters got so bad, future Mavs Hall of Famer Dirk Nowitzki felt the need to chime in with some subliminal shots of his own, stating “the new NBA is about making money and not about being loyal anymore. For me, it’s easy to be loyal.” Now, that’s the kind of mentality a true leader is made of. In reality, no organization has ever been disloyal to LeBron. It’s always been him who turned his back on his teams in the past. Although these cynical statements by LeBron filled the Lakers young core full of stress and anxiety, they actually seemed to be rooted in nothing more than projection. The disloyalty was starting to get so bad that it resulted in terrible roster moves- LeBron needed a shooter.. and his solution? He had Magic trade the teams’ most promising big man in Ivica Zubac to the Los Angeles Clippers for a mediocre shooter in Mike Muscala. It was such a bad move that when told of the potential trade, Clipper coach Doc Rivers expressed shock, exclaiming, “Wake up, no way! That’s not gonna happen.” It doesn’t help that when Magic (who is a rookie in all of this) took the job as President of Basketball Operations, he hired a beginner in Rob Pelinka to be GM. 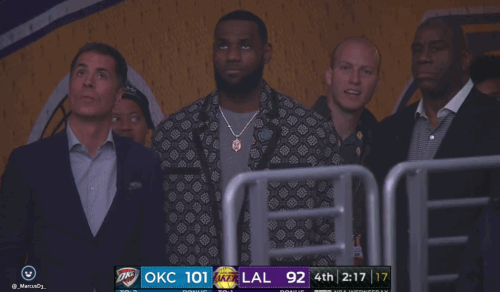 In order to handle a diva like LeBron, you clearly need some experience, and Pelinka was known more for his work as a sports agent than he was for his basketball acumen. What’s the solution? Like Laker superfan Flea (of the Red Hot Chilli Peppers) stated on Twitter, “I don’t give a sh-t about a star, build a team that loves and plays together.” But is it still a possibility? Of course.. There are many scenarios in which the Lakers could ultimately prevail- the best option would be for Magic to man up and take control by trading LeBron. His value won’t get any better than it is now, and with all that wear-and-tear on his body, it’s tough to imagine him doing any better at age 35 than he did at 34. The Lakers would be able to acquire incredible assets for LeBron, while once again becoming a desirable destination for free agents that are more fitting and far less of a migraine. More importantly, trading LeBron will restore Magic’s dominance and remind everyone who’s boss. Unfortunately, this may only be a pipe dream for Laker fans.. The more plausible option? The original plan! Yes, Laker fans, as much as it seems like the sky is falling, there may very well be a light at the end of that tunnel. There is still hope that Magic pulls a rabbit out his hat by landing another big free agent this offseason for LeBron to play behind, while still allowing the young core (of Lonzo Ball, Brandon Ingram, & Kyle Kuzma) to breathe. In a free agent class that includes Kevin Durant, Kawhi Leonard, Klay Thompson, Kyrie Irving and much more, signing a 1st option scorer would make Laker fans quickly forget how much they had to suffer watching this LeBron lead team. When it’s all said and done, if the man once known as “Tragic” for his blunders redeems himself, the Magic will once again be restored, and the GOAT franchise will be right back on its road to glory. LET THE CHIPS FALL WHERE THEY MAY. got to blame jeanie too! It’s obvious, LeBron owns Magic. I dont see how its now Lebron?